Teodorin Obiang, the eldest son of Equatorial Guinea’s president, was put on trial in absence on Monday in France. He is accused of buying palatial Parisian properties and exotic cars with money plundered from his native country, a small oil-rich state on Africa’s west coast. 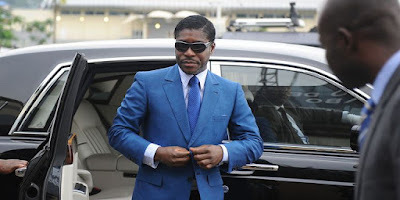 Mr Obiang, who is also a vice-president of the country, denied the charges of laundering embezzled public funds, which expose him to a sentence of 10 years in jail and huge fines if convicted. In addition to luxury clothing and jewels, prosecutors say Mr. Obiang, 48, built up an exceptional collection of costly cars, which along with clothes, jewels and real estate took the value of all his assets to around 100 million Euros ($105 million). Mr. Obiang says his purchases were above-board. But prosecutors say the assets do not tally with his salary at the time of the purchases. According to a parallel U.S. inquiry, he earned $80,000 a year as farming and forestry minister, a post that obliged him to refrain from other business dealings. Beyond Mr. Obiang’s case, the broader French probe known as the “ill-gotten asset” investigation concerns purchases in France by the family of Gabon leader Ali Bongo as well as Congo Republic leader Denis Sassou Nguesso.